Tree Radar – A Non Invasive Evaluation Acworth, GA - Matthew's Tree Service Inc.
A complete evaluation of the health of the tree as well as a risk assessment is limited when only a surface inspection is utilized. The tree may have a lot of root mass damage or excessive decay which indicates trouble but this can be difficult to quantify without the right assessment tools. Over the years arborist have made use of a variety of different tools in order to take samples of tree trunk tissue. These tools have included the Densitomat, Resistograph®, and other similar drilling type devices. The invasive nature of these tools leave puncture marks on the trunk at the point of sampling. In addition these tools are not very effective since generalizations are made based on the limited samples that are gleaned from the tree trunk. At Matthew’s Tree Service Inc., we provide an innovative way to measure trees which is completely non-invasive by using the Tree Radar. The Tree Radar Unit is a version of a ground-penetrating radar that is completely portable. It is utilized to provide accurate measurement, analysis, and a comprehensive interpretation of the health of the tree and its structural integrity. Ground-penetrating radar (GPR) sends out electromagnetic pulses into whichever object is being investigated. The GPR receiver senses waves that are reflected from objects or layers of varying densities and moisture content. Information that is collected at points of the GPR antenna provides insight into the object being scanned. 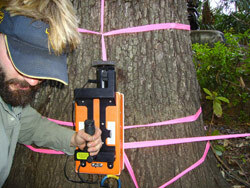 Trunk evaluations and root evaluations are accurate and concise when TRU technology is utilized. Contact us for more information about these services by calling (770) 926-7985 today.